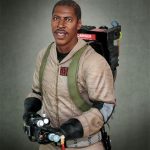 The last addition to Hollywood Collectibles Group's Ghostbusters statues line is Winston Zeddemore, portrayed by Ernie Hudson. 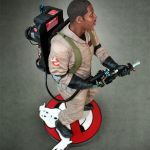 This 19-inch tall, hand-painted, limited edition statue comes with a Ghostbusters-style base and is made from Polystone. The exclusive edition of the Winston statue is limited to only 250 pieces, but a regular edition is also available, and we have a look at images and details. 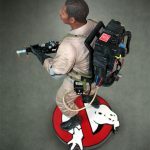 From Hollywood Collectibles Group: "We are proud to present the final piece in our very popular line of Officially Licensed Ghostbusters statues…Winston Zeddemore!! 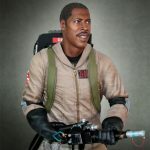 Featuring an outstanding likeness of Ernie Hudson in character as Winston, this incredibly realistic statue stands approx 19” tall on its Ghostbusters-themed base. As with all Hollywood Collectibles pieces, this Museum Quality statue is constructed from heavyweight Polystone and then hand painted to the finest detail. Sculpted by Trevor Grove and Alterton, paint masters by Silver Surfer Lab."